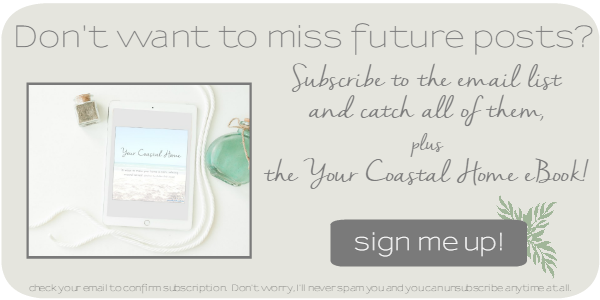 So…I had really hoped and planned to have started on the cabinet painting part of our rustic gray kitchen makeover by now and be able to share a sneak peek with y’all today, but (as usual) things have popped up and have had to be pushed back a bit for that. BUT, I have been able to proceed on a couple of my to-dos, and I am equally excited about them as the cabinets. This afternoon we are having the electrician remove the insane track light system, move the junction so it’s centered, and install our beautiful 3-light pendant in its place, plus install the matching single breakfast nook pendant as well. I can’t even tell you how stoked I am to get rid of that track lighting!! 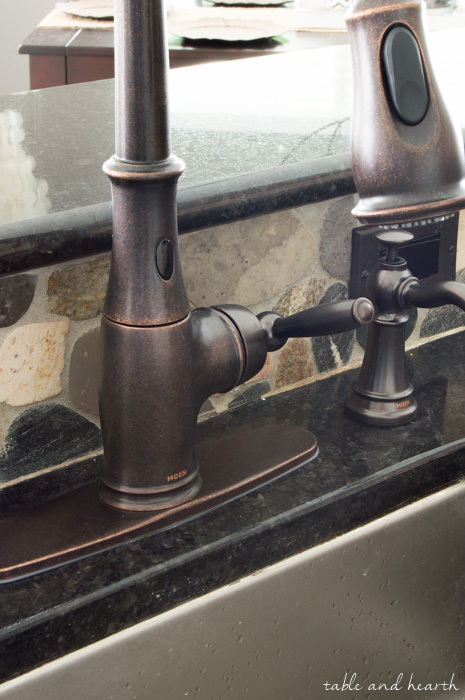 And the other thing we knocked off our list was the new “Brantford” Moen Motionsense faucet!! I pretty much have no words for how AMAZING this thing is you guys, like, I don’t even know where to start with this post about it. 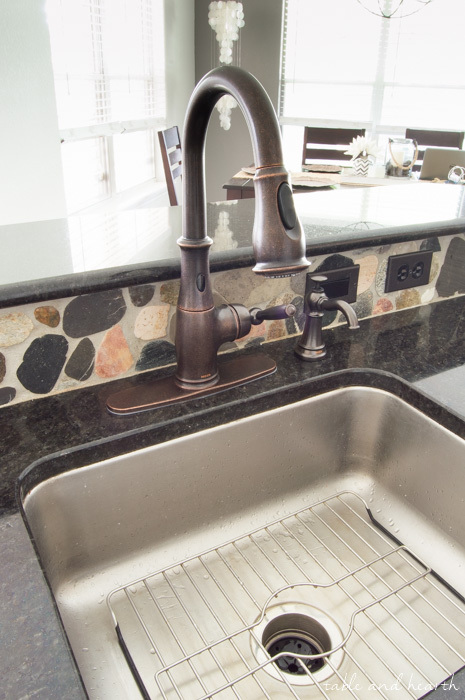 Here is our original faucet. 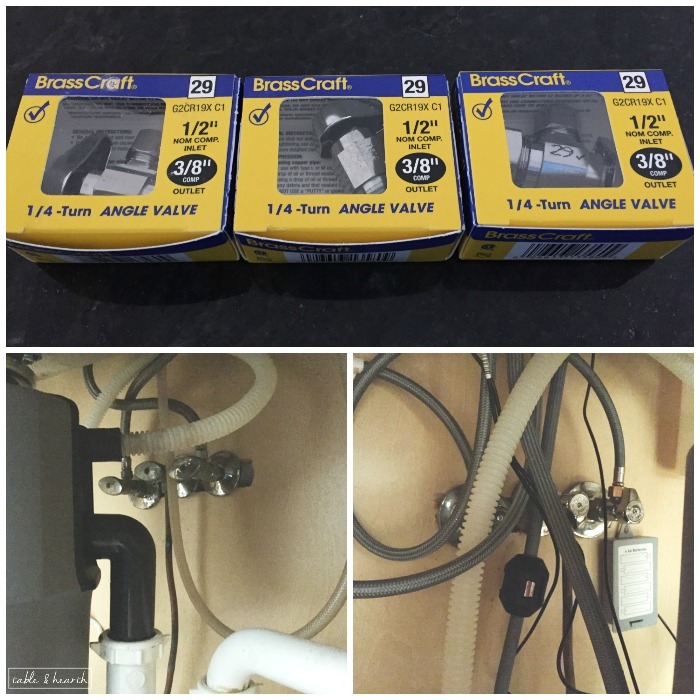 It was also a Moen, but hadn’t been well taken care of and had alot of corrosion which was causing it to leak at the stem, as well as old valves which made it drip incessantly. We have super hard water so many of our fixtures have that nasty green crusty corrosion and it drives me nuts. I cannot thank the folks at Moen enough for sending me the faucet of my dreams for this project (plus a matching soap dispenser). No kidding, this thing has been on my Christmas list the last three years, and it was just like Christmas morning opening these boxes. 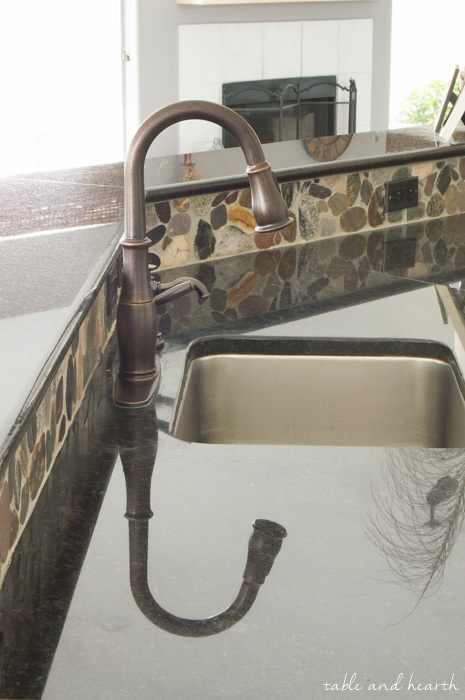 The Motionsense faucet has a little battery-powered control box that mounts in the cabinet by the valves to run the sensors on the faucet. It’s got a sensor on the top, a sensor on the bottom front, then a regular handle too. The main handle obviously works like regular, but the front sensor turns the faucet on for any time there is something held in front of it/under the faucet. 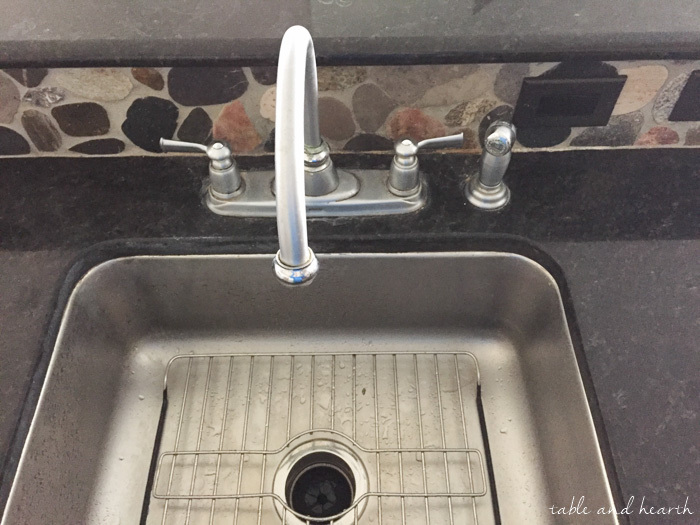 As soon as that object is moved, the faucet turns off. 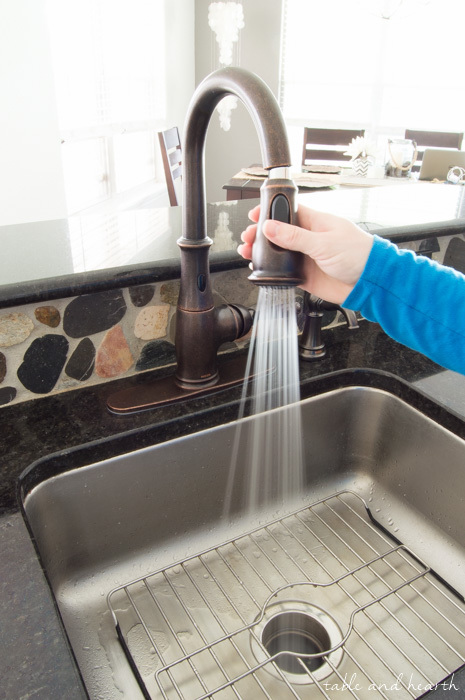 We use this feature for washing our hands, wetting a towel or something, and quickly washing veggies. If you wave over the top sensor, the faucet turns on for two minutes. Waving over it again turns it off. We like this one for washing a few dishes or filling pots. In addition to all that, it also has a pull-down spray head with Moen’s Reflex technology which rolls it up and docks it easily when done. I was so worried about getting rid of our separate sprayer but this one works even better and gets to more areas. It is possible to turn either or both of the sensors off if you don’t want to have them on. It does take some getting used to, especially the front one that comes on anytime it senses something in front of it. We have learned what sets it off so it doesn’t happen too often, but it may be pretty sensitive to some. We put a matching soap dispenser in the fourth hole we had and I am so happy to not have to have a jar of soap on our countertop anymore. It goes so well with the faucet too. We are so, SO spoiled by this guy already and find ourselves waving our hands under faucets at work like a bunch of goons. I have no idea how we ever functioned without this faucet and it’s everything I hoped it was. It has already freed me of my flour, meatball, dirt, and paint-covered hands, much to my OCD husband’s delight. 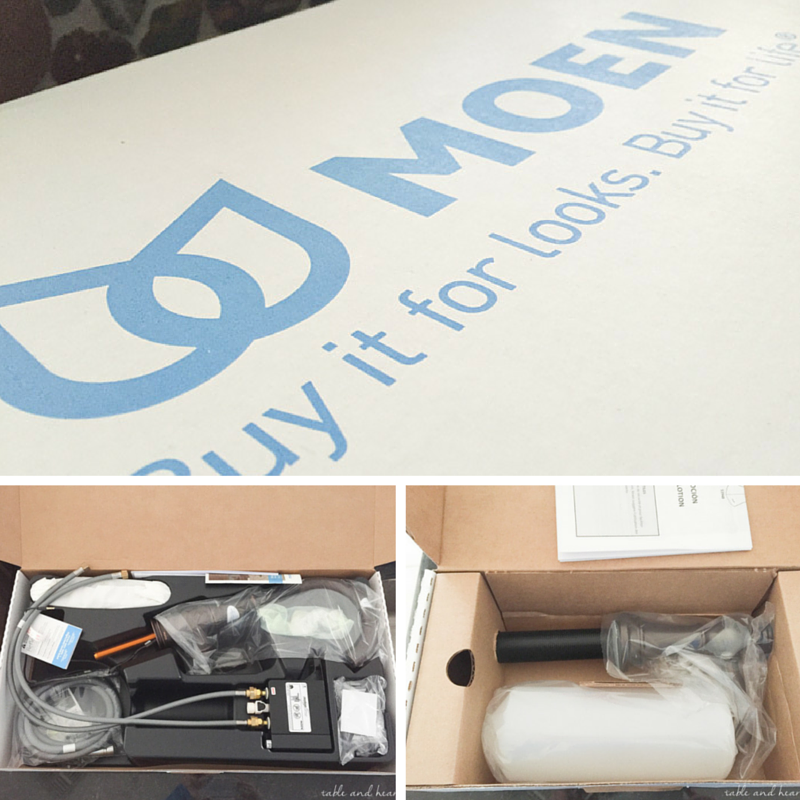 Thank you SO much again to Moen for sending over this faucet, we absolutely love it (and all the other Moen faucets we have)!! Stay tuned for peeks at the new lights in the next week or so, and I promise to get started on those cabinets!! Gotta do that before it’s 8 million degrees outside. 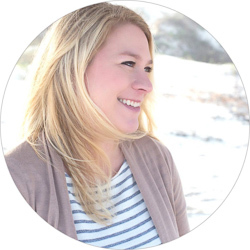 Follow Emily @ Table & Hearth’s board Kitchen Update Ideas on Pinterest. 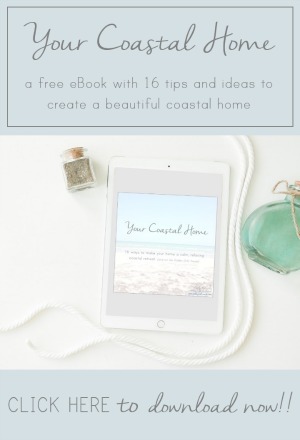 Learn how to Create “Your Coastal Home” – A New (free) eBook! Holy smokes, look at the difference it makes! GORGEOUS! LOVE how the colour plays off of that beautiful backsplash! Can’t wait to see those new lights!!! Wow, what a difference! I LOVE the color of the new faucet and how cool that it’s hands free! Thank you Katie! We LOVE it!! 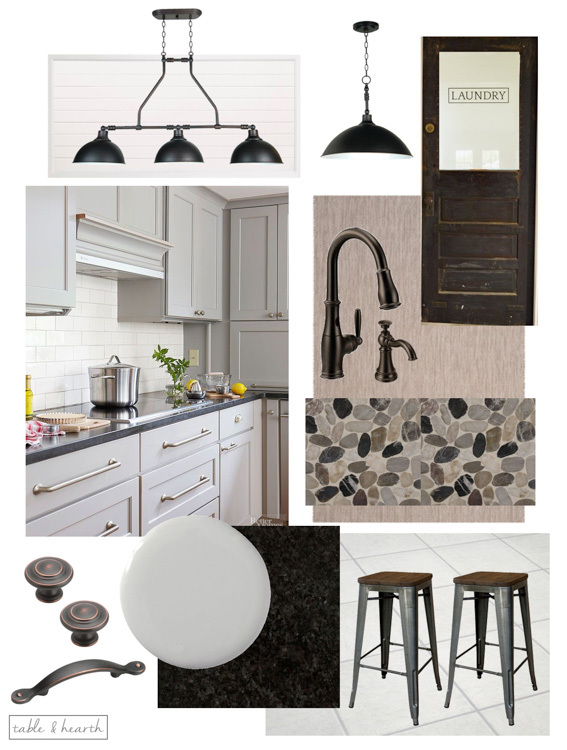 What color grey are you using for the cabinets? Light, Medium or dark? Now that is stylin’ girl. So nice for Moen to send you faucet/soap dispenser. 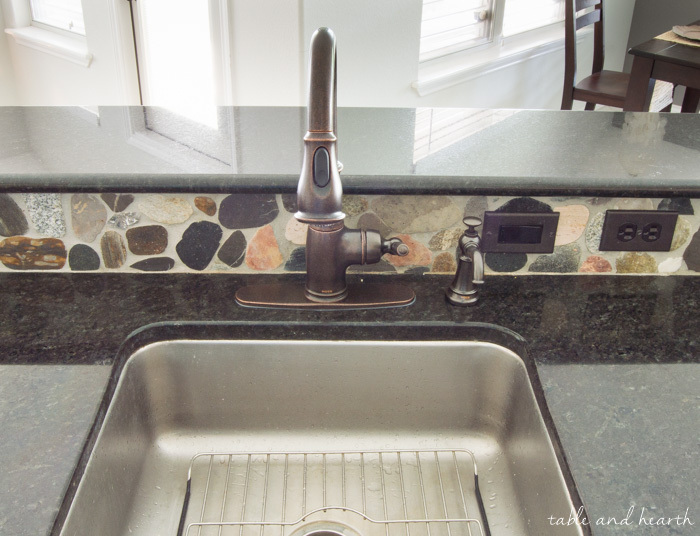 It looks so pretty with your counter top and back splash. Have to admit am quite envious. 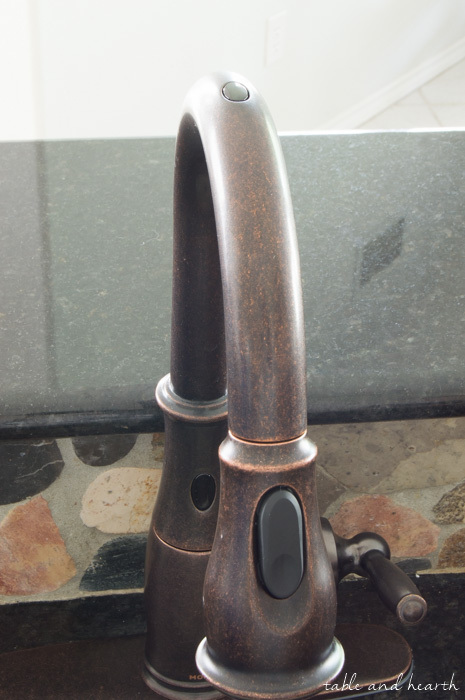 The new faucet is gorgeous! Love the color and the sensor is such a nice feature. I know right?! I don’t even remember what it was like to have that old leaky one there, thank goodness. This faucet is amazing!! So beautiful and goes with your kitchen so well! Love it! 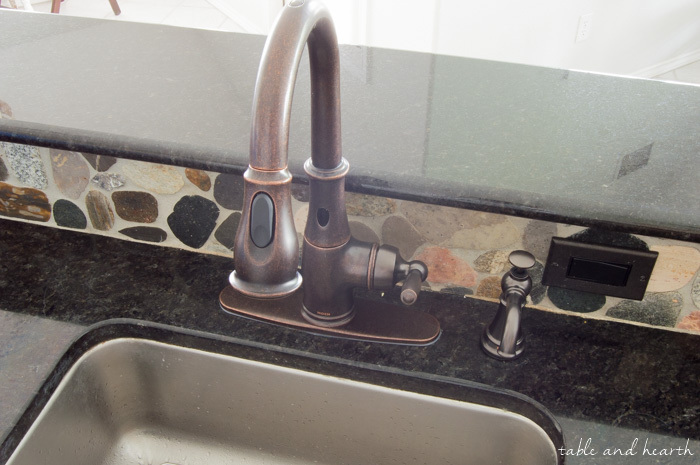 Who knew a simple faucet change could make our kitchen look so much better?! Thanks Linda!! I need a faucet like this immediately. I love it! Ooooo very pretty! It looks great in your kitchen!